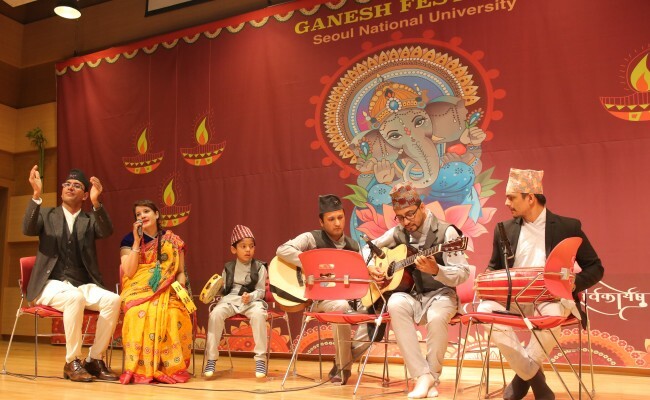 Indian communities in Korea on Sept. 16 celebrated Ganesh Chaturthi, the birthday of Hindu god Ganesha and India’s landmark festival, at Seoul National University. Some 400 Indians, Koreans and international participants from various parts of the country joined in the jubilant honoring of the elephant-headed deity associated with intelligence, knowledge, wisdom and prosperity. It began with the installation of a Ganesh idol on a vibrantly decorated stage with flowers and lights, accompanied by Indian spiritual music. Priests from the International Society for Krishna Consciousness Temple Seoul performed puja worship -- where worshipers pray and honor the lord with fruits, milk, cloth, oil or ghee lamps and other offerings -- and aarti ritualistic songs, followed by the chanting of Vedic mantras to invoke the believed spirit of Ganesha. Coconut, modaks, fruits and red flowers were also offered to the god. “Lord Ganesha is believed to be the remover of obstacles, patron of arts and sciences and diva of intellect and wisdom. He is widely and popularly known as Ganapati or Vinayaka,” said Rohidas Arote, an associate professor and director of Nanomedicine Laboratory in the School of Dentistry Department of Molecular Genetics at the university. At the celebration, Indian Embassy Deputy Chief of Mission Satish Sivan gave an inaugural speech. Staff from the Indian Embassy, Indian Chamber of Commerce in Korea, Indian Merchants Association, Indian Students Association and other organizations also came. Cultural performances of Ganesh vandana, classical dance, singing and kids fashion show were featured. Soma Dutta, a yoga teacher at the Indian Embassy’s Indian Cultural Center, performed classical Kathak dance and gave a brief lesson on meditation. The event was first celebrated by the university’s Indian Student Association in 2007, and has since been a major annual festival for local Indian communities. This year’s sponsors and supporters are the State Bank of India, Green Floral, Otsal Indian Restaurant, International Society for Krishna Consciousness Temple Seoul and Pochon and Ayurveda Korea, among other institutions.